Is the state holding money for you right now? 15 names of Arizonans on the list! You could have money waiting! There's one place where some of you may have money waiting. And it's not a scam. 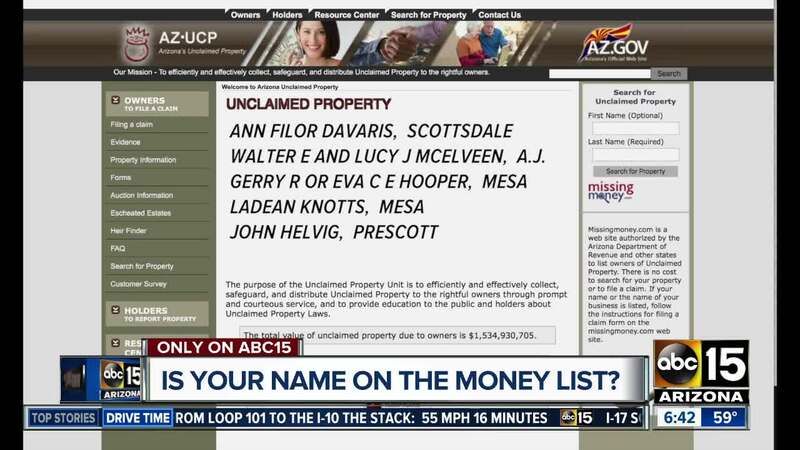 It's the state's unclaimed money program with more than one billion dollars waiting for owners. Ed Greenberg, with the Arizona Department of Revenue, says the money can come from old safe deposit boxes, forgotten checks. and other places. It's then turned over to the state and held for 35 years while the department searches for owners. After that 35 year deadline, the money becomes part of the state's general fund. Find out if you're on the list! The Department gave us 15 names of people they want to find. They've been on the list so long, they are approaching the deadline. If any of these people have passed away, their families can file a claim and go through the screening process.